Fiesta is a relatively new English apple, developed in Kent in the 1970s but with a very traditional English style and flavour. 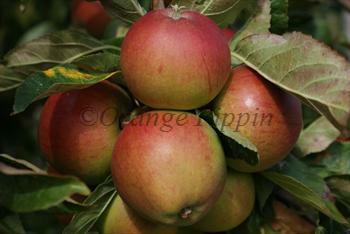 Cox's Orange Pippin is one of its parents, and it has inherited the classic Cox aromatic sweet/sharp flavour. Visually it also looks the part, with the attractive orange flush so typical of traditional English apples. Fiesta is one of the best apples for juicing. It produces copious amounts of juice, with a very good rich sweet / sharp flavour. 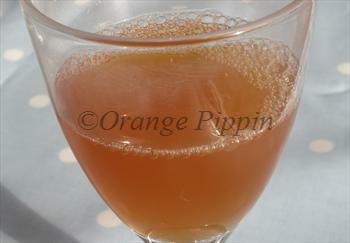 It can also be used as a substitute for Cox's Orange Pippin in apple cookery - slices keep their shape when cooked. Unlike Cox's Orange Pippin, Fiesta also stores very well and remains firm and sweet - a quality it probably inherits from its other parent, an American variety called Idared. 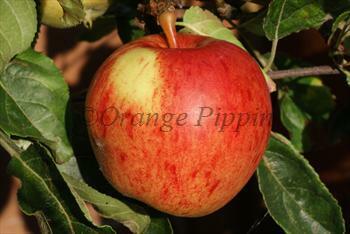 Fiesta is grown commercially on a small-scale in the UK and France, sometimes marketed as Red Pippin. It is easy to grow and a reliable cropper, making it an excellent choice for the garden or small orchard. Fiesta® is a protected variety. Please fill in the details below and we will let you know when Fiesta apple trees are back in stock. Like Fiesta, a good Cox-style apple and easy to grow. Fiesta is a sibling, sharing the same parents. Widely considered one of the best flavoured of all Cox-style apples. A pretty red apple with an excellent flavour, and like Fiesta a good keeper. Fiesta is in flowering group 3. Fiesta is partially self-fertile, but fruiting will be improved if there is a compatible tree of a different variety nearby. Since it flowers in the middle of the blossom season it can be pollinated by most other apple trees. Fiesta is easy to grow and is an excellent substitute for Cox, inheriting much of the rich aromatic flavour - but few of the horticultural difficulties. Fiesta has better than average tolerance to poor soils including chalky soils. Developed in the 1970s at the East Malling Research Station in Kent, UK. Fiesta is a cross between Cox's Orange Pippin and Idared. It is sometimes known as 'Red Pippin'.